Please consider partipating in Friday's dress down day! For at least a $1.00 donation, you can enjoy an out of uniform day. All proceeds will benefit the Matthew Reardon Center for Autism. We are over half-way though our CRCT administration! I'm glad to see an overall sense of relaxation and confidence as we navigate this sometime stressful time of he school year. Keep that momentum going, you are just about to the end! The science CRCT will be this Wednesday, and the social studies will be Thursday. We will spend Monday and Tuesday reviewing our science lessons we've had this year. Please take the time to tidy up you PIN folder so it is easily usable for our review. We will also take some time to continue our work with our musical scene. As each committee finishes their work, we will present it to the entire class for feedback. Our goal is to finish our script and song this week. As soon as we complete the final copy of the script, we can cast it. We can also start on choreography, costumes, and props. All work must be completed by the end of the day next Tuesday. Remember, the key to a successful finished product is your ability to work together and compromise. Every decision you make should be focused on the "good of the whole" and not simply personal preference. I hope for this to be the most challenging work you will do this year, and for you to feel very proud of the finished product. Thank you, Ellis PTA for the healthy snacks for breakfast this morning! Enjoying our bananas from the PTA. Please take this Earth Day to reflect upon how you fit into the interdependent web of living and nonliving things on our beautiful planet. Check out the cool calculator below from www.earthday.org (Click on "Footprint" at the bottom of the page) that will show you how much of an effect you have on the world around you. Wow, what a gloomy first day of holiday! I hope the rain isn't giving you the blues. Take this opportunity to relax and enjoy your day off. Well, CRCT week is finally here! This week we will be taking the Reading CRCT on Wednesday, the Language Arts on Thursday, and the Math on Friday. Please check out the CRCR Review page of this blog for more information about the test and how you can best continue to prepare for them. We will have plenty of time in class to review these together. You will also have some time to log onto Compass Learning for some practice, too. It is my hope that the last month of review has given you the confidence to do the best on Friday's test as you can. In addition to our math activities, we will be starting our review of the science topics we've talked about this year. We will use our "Putting It All Together" books to guide our review. If you haven't done so already, please start looking through your PIN folder and refreshing yourself with the Earth science material you've investigated. You may want to place emphasis on geology, since we've studied that at the very beginning of the year so long ago. The science CRCT is next week, so our review will be much more concise than what it has been with math. As if we don't have enough to think about, we must also get our song written for the musical. Our goal will be to have a finished song by Friday! If you are submitting an entry for the musical poster and ticket design, please give it to Ms. Tiia by Friday. I hope you have a wonderful Spring Recess! I'll see you Tuesday morning! In order to adhere to school policy, and in the interest of the safety of our students, please NEVER send any medication, even over-the-counter medication and vitamins, etc…, to school with your child. Students are not allowed to carry any medication at school, unless they have a signed authorization from their physician to do so. Even in the case of a student who has permission to carry medication from their physician, the school must have the approved form on file with the nurse which states what type of medication the student is carrying, and for what condition. Please understand that many students have severe allergies to common medications, and common medications can also be toxic in the wrong dose for a student’s age and weight. Even iron and other elements in vitamins can be toxic to small children, or if too much is taken. Our first priority should always be the safety of our students. Please bring any medication you would like for your child to take during the day to the nurse. I am here from 8:00am until 3:30pm daily. If it is not possible for you to bring the medication directly to me, I will be glad to make other arrangements for you. Please call me at 912-395-5474, and we can work out a way for you to have the medication only stay in the hands of a staff member. Please see the attached SCCPSS regulation regarding Medicines. Thank you for all you do to help keep our students safe! On our trip to the Massie Heritage Center in February, I was amazed at how excited you all were to learn about and identify common architectural features found in buildings. During the entire trip my brain was buzzing with how I could bring the architectural studies back to our classroom and fit it into our science and math lessons. After doing some research and talking to a colleague, I came across an opportunity to travel to Chicago, meet other teachers, and work together to come up with lessons focused on architecture. You inspired me to apply, and I'm happy to report that I was accepted into the program! 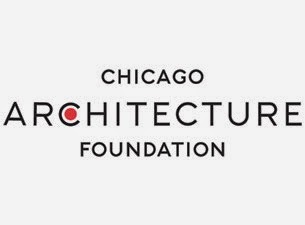 In July, I will travel to Chicago and work with those at the Chicago Architecture Foundation in a workshop called "The American Skyscraper: Transforming Chicago and the Nation". I'm so excited for this opportunity to travel to a new place and work with other teachers to come up with fun lessons to bring back to Charles Ellis. Thank YOU, because your enthusiasm inspired me to pursue this opportunity! You are invited to wear purple (with uniform bottoms) this Wednesday Thursday to show support for the Ellis military families! We are thankful for all those who serve our country! Tomorrow is Spring Picture Day. It is an out of uniform day, as well. Don't forget to wear your smiles! It's going to be a short week because of our Spring holiday starting this Friday, but we have a lot to accomplish! We will work on these concepts together in class and during your Compass Learning computer time. You will have homework from your "Putting It All Together" review booklet Monday and Tuesday evening. You will NOT have a math quiz this week, so please take your homework and classwork very seriously. In science, we will wrap-up our studies of outer space. Your "Seeing Stars" choice sheet is due THURSDAY (remember, no school Friday). You will also have your universe test on Thursday. Use your study guide and vocabulary sheet to prepare for the test. In addition to our studies, keep in mind that school pictures will take place on Tuesday. Progress reports will be sent home Wednesday and should be signed and returned Thursday. They will not include a rundown of your assignments, just your grade and grace & courtesy report as of that date. Please log onto PowerSchool Parent Access to view your individual assignment grades. I noticed that I may have written the wrong averages on some students' math quizzes today. Of course, I noticed after I gave them back to the students! I've updated the grades for those students affected. Please log on to PowerSchool to see your correct grades. Stories of a Norwegian skydiver hit by a meteorite went viral this past weekend. Based upon what you know about space objects, terminal velocity, and other research you've done, do you believe this actually happened? Field day is May 9th! Show some Ellis Bobcat Spirit by purchasing a t-shirt to wear to field day! All proceeds will go towards our PE department. The deadline to purchase a shirt is April 11. Math tutorial will be cancelled on Tuesday, April 8th. The science tutorial on Wednesday, April 9th and the math tutorial on Thursday, April 10th will be held from 7:15-8:00 as scheduled. Please note that these tutorial are invite only. The first of four consecutive total lunar eclipses takes place on the night of April 14–15, with excellent viewing prospects all across the U.S. and Canada. From Simi Valley, California, December 2011's totally eclipsed Moon hung just a few degrees above the western horizon. The southern half (lower left) of the disk, nearest the umbra's outer edge, is relatively bright. North America hasn't had a total eclipse of the Moon since 2011. But this long dry spell will break early on April 15th (beginning late on April 14th for the West Coast), when the full Moon passes through the umbra — the dark inner core of Earth's shadow. The diagram and timetable below tell what to expect and when if you live in North America. The eclipse will also be visible from South America and much of the Pacific. In eastern Australia the Moon doesn't rise until the total eclipse is already underway on the evening of the 15th. Penumbral eclipse: Shading starts to occur when the Moon's leading edge enters Earth'spenumbra, the outer portion of its shadow. But initially the effect is weak — you won't start to see a dusky fringe along the Moon's leading limb (celestial east) until the disk intrudes about halfway across the penumbra. As the Moon glides deeper in, the shading becomes much more obvious. Use this map to determine whether the Moon sets or rises during any stage of April's eclipse. Because an eclipsed Moon is always full, moonset or moonrise happens in a very bright sky. Partial eclipse: More dramatic is the Moon's entrance into the umbra, where no direct sunlight reaches the lunar surface. Few sights in astronomy are more eerie and impressive than watching this red-black shadow creeping, minute by minute, across the bright lunar landscape, slowly engulfing one crater after another. If you're so inclined, there's scientific value in carefully timing these crater crossings. As more of the Moon slides into the umbra, a second, deeper night is falling around you as more stars come out in what had been a full-Moon-washed sky. An hour or so into partial eclipse, only a final bright sliver remains outside the umbra and the rest of the Moon is already showing an eerie reddish glow. Late-night skywatchers get to witness a total lunar eclipse in the early morning of April 15, 2014. (For West Coast observers, early phases of the eclipse occur late on April 14th.) Due to the Moon's off-center path through Earth's umbra, the northern half of its disk should look especially dark during totality. Click on the image for a larger version. Total eclipse: From the Moon's perspective, the Sun remains completely hidden for 1 hour 18 minutes. From Earth's perspective, the lunar disk isn't completely blacked out but instead remains dimly lit by a deep orange or red glow. Why so? Our atmosphere scatters and refracts(bends) sunlight that grazes the rim of our globe, so that red glow comes from all the sunrises and sunsets around Earth's terminator at the moment. If you were an astronaut standing on the Moon, you'd see Earth ringed with a thin, brilliant band of sunset- and sunrise-colored light. On rare occasions the eclipsed Moon does go black. Other times it appears as bright and coppery as a new penny. Sometimes it turns brown like chocolate, or as dark red as dried blood. Two factors affect an eclipse's color and brightness. The first is simply how deeply the Moon goes into the umbra — the umbra's center is much darker than its outer edge. The second is the state of Earth's atmosphere all around the terminator. If the air is very clear, the eclipse is bright; if it's mostly cloudy (or polluted with volcanic ash from a major eruption), the eclipse will be dark red, ashen gray, or almost black. Aligning his camera on the same star for nine successive exposures, Sky & Telescope contributing photographer Akira Fujii captured this record of the Moon’s progress dead center through the Earth’s shadow in July 2000. Adding to the late-night spectacle will be the bright star Spica shining only about 1° or 2° from the Moon and brilliant Mars about 9° to the west. Partial eclipse: Totality ends once the Moon's leading limb peeks back into direct sunlight, and after that events unfold in reverse order. If you're using binoculars or a small telescope to view the eclipse, watch as lunar features slide back into full view. Penumbral eclipse: When all of the Moon has escaped the umbra, only the last, penumbral shading is left. This final duskiness gradually fades away, leaving the full Moon shining as bright and white as ever. Notably, of the three lunar eclipses in 2013, two were penumbra-only events. Penumbra first visible? 5:20 1:20 a.m. 12:20 a.m 11:20 p.m. 10:20 p.m. Partial eclipse begins 5:58 1:58 a.m. 12:58 a.m. 11:58 p.m. 10:58 p.m.
Total eclipse begins 7:07 3:07 a.m. 2:07 a.m. 1:07 a.m. 12:07 a.m.
Mid-eclipse 7:46 3:46 a.m. 2:46 a.m 1:46 a.m. 12:46 a.m.
Total eclipse ends 8:25 4:25 a.m. 3:25 a.m. 2:25 a.m. 1:25 a.m. Partial eclipse ends 9:33 5:33 a.m. 4:33 a.m. 3:33 a.m. 2:33 a.m.
Penumbra last visible? 10:10 — 5:10 a.m. 4:10 a.m. 3:10 a.m. If it's cloudy from your location in North America, you won't have another long wait for the next total lunar eclipse. The next one comes on the morning of October 8th for the whole continent except the farthest northeast. In fact, April's event is the first of four consecutive total lunar eclipses in 2014–15! Such eclipse tetrads are not common — the last one occurred a decade ago, but the next won't begin until 2032. Welcome to the first week of April! While I do enjoy the warm weather, the pollen that comes with it I could do without. I think we've gone through more boxes of tissues in the classroom since spring break than we have the entire year! Between your sneezes, we have quite a busy week in room 18. In class, we will review do a lot of reviewing together focusing on expressions and equations. Your Compass Learning time will include additional practice based upon the lesson you requested. You will have a review quiz on Thursday. These review quizzes are "give me" grades...90% of the questions are taken directly from your classwork that we complete together! Take advantage of this fact by using your classwork pages to prepare for the upcoming quiz. We will also be working through the last administration of the MAP assessment. We will compare this score to the one you had at the beginning of the year to show the growth your made in math. Your results will be shared at the end-of-the-year parent/teacher conferences. In science, we will wrap up our studies on outer space by looking at the origin of our universe and other object, besides plants, found within it. First, I will present the beginning of the God With No Hands Montessori great lesson to get our minds contemplating how the universe may have begun. Here is a copy of the script the 4,5,6 classes wrote when we presented the great lesson as a musical! We will then talk about the lifecycle of stars. 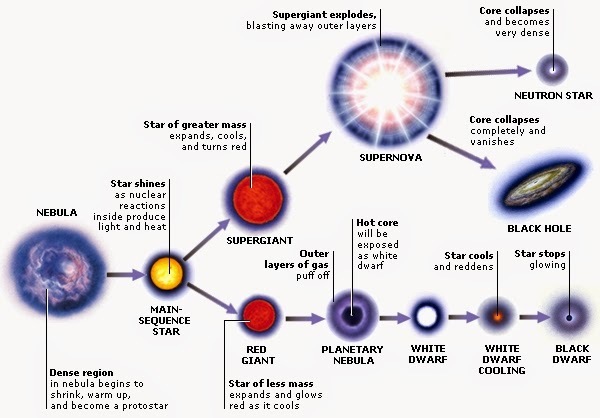 Here is a great diagram showing the lifecycle of stars. Finally, we will investigate the differences between comets, meteors, meteoroids, meteorites, and asteroids. You will have a vocabulary quiz based upon the following words this Friday. To help guide your research, please complete the following choice sheet. It is due THURSDAY, April 17... we do not have school Friday, April 18. You will have your final test on outer space Thursday, April 18. Use the following study guide to help you prepare for it. Now is the time you should be spending a lot of time in your PIN folders reviewing both math and science topics we've studied this year. First, look at your past tests and identify things you need to practice a bit more. If you have trouble finding materials to help you study, please let me know and I can get items together for you. Don't forget to check out my CRCT Review page on this blog for more ways you can get ready for the tests. Testing dates are found on the classroom calendar. We had a great time today walking along River Street and learning why the Savannah River is so important to our city. After a tour of the water front and Factors Walk, we enjoyed a nice picnic by the Waving Girl statue. Please Be In Uniform Friday. Since we will be leaving campus for our field trip, please wear your uniform Friday. I'm so excited to read your solar system essays! Please complete your rough draft at home tonight if you didn't do so in class today. Tomorrow, we will peer edit them and write our final copies. Be sure you are using your outline and rubric as a guide while you work. Your final copy is due Friday.